We choose the Vista, because it is a newer ship, and had great reviews. It was very pretty, and the LED light displays were amazing. We missed; however, the large central area. We had trouble getting our bearings on the ship because there was no central point to help us. The ship was very pretty, but not spectacular. Our cabin was lovely. We were in the spa area, so the colors were pleasing. Our cabin was spotless, and our room steward was the best we&apos;ve ever had. His name was Yasa, and he was extremely efficient and courteous. We weren&apos;t looking for a lot of activities as we have cruised for years and we just enjoy going to sea. We did have some serious problems. We noticed that the hand sanitizers were not working most of the time. There was no one at the entrances to the eating establishments to see to it that all hands were sanitized. We were a party of 16, and when we got off the ship, Eight of our party either had the flu or strep infections. The floor in the Lido Cafe was slick when the humidity was high, which was most of the time. They either need to replace that tile or run matting down the surface. One of the biggest problems we encountered was the smoke from the smoking areas. They had one of the smoking areas right outside the children&apos;s play area. Our twins were taken there to play, but their parents took them away immediately because of the smoke. The smoking in the casino has gotten out of hand due to the Vaping people we&apos;re doing. It&apos;s time to stop the smoking in the casino. Celebrity doesn&apos;t allow smoking inside their casino, and it is just as active as the Carnival Casino. We probably will not go on the Vista again, because it is not really handicap accessible. We were on deck 11, and couldn&apos;t go to the stern from our hall, because there were two steps at the end of the hall. We had to go up and down many elevators to get from one end of the ship to the other. The spa area needed work. There were overhead lights out as well as some of the jets in the tubs weren&apos;t working. the entertainment was spectacular, but the lasers flashing everywhere were hard to deal with. The Liquid Lounge was too small for a ship that size, and having all the center seating on the same level on the main floor made it hard to see, especially if you were in a handicap area. there are no card areas with the exception of the Library which was doubling as the display area for purchased art. They were complaining that the art sales group didn&apos;t have a place for their business that was big enough. The designers of this ship missed the boat! The main saving grace for us was the wonderful crew. The workers were super. They also made it possible for our entire family to be together at a huge round table for our evening meals. That was so appreciated. To sum up our observations, we will go on Carnival again, but not Vista. 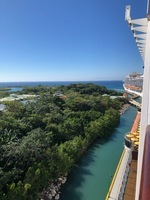 Our Embarkation and disembarkation were perfect. Everything was extremely well organized. The only wait we had was because of customs. 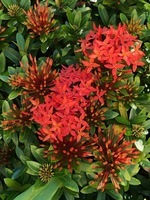 We love the flowers in the Western Caribbean. We choose the Vista, because it is a newer ship, and had great reviews. It was very pretty, and the LED light displays were amazing. We missed; however, the large central area. We had trouble getting our bearings on the ship because there was no central point to help us. The ship was very pretty, but not spectacular. Our cabin was lovely. We were in the spa area, so the colors were pleasing. Our cabin was spotless, and our room steward was the best we&apos;ve ever had. His name was Yasa, and he was extremely efficient and courteous. We weren&apos;t looking for a lot of activities as we have cruised for years and we just enjoy going to sea. We did have some serious problems. We noticed that the hand sanitizers were not working most of the time. There was no one at the entrances to the eating establishments to see to it that all hands were sanitized. We were a party of 16, and when we got off the ship, Eight of our party either had the flu or strep infections. The floor in the Lido Cafe was slick when the humidity was high, which was most of the time. They either need to replace that tile or run matting down the surface. One of the biggest problems we encountered was the smoke from the smoking areas. They had one of the smoking areas right outside the children&apos;s play area. Our twins were taken there to play, but their parents took them away immediately because of the smoke. The smoking in the casino has gotten out of hand due to the Vaping people we&apos;re doing. It&apos;s time to stop the smoking in the casino. Celebrity doesn&apos;t allow smoking inside their casino, and it is just as active as the Carnival Casino. We probably will not go on the Vista again, because it is not really handicap accessible. We were on deck 11, and couldn&apos;t go to the stern from our hall, because there were two steps at the end of the hall. We had to go up and down many elevators to get from one end of the ship to the other. The spa area needed work. There were overhead lights out as well as some of the jets in the tubs weren&apos;t working. the entertainment was spectacular, but the lasers flashing everywhere were hard to deal with. The Liquid Lounge was too small for a ship that size, and having all the center seating on the same level on the main floor made it hard to see, especially if you were in a handicap area. there are no card areas with the exception of the Library which was doubling as the display area for purchased art. They were complaining that the art sales group didn&apos;t have a place for their business that was big enough. The designers of this ship missed the boat! The main saving grace for us was the wonderful crew. The workers were super. They also made it possible for our entire family to be together at a huge round table for our evening meals. That was so appreciated. To sum up our observations, we will go on Carnival again, but not Vista. Our Embarkation and disembarkation were perfect. Everything was extremely well organized. The only wait we had was because of customs. The cabin was lovely. Our cabin steward (Yasa) was fantastic. The only problem we had was the tub shower. The jacuzzi tub had a glass door, and the frame raised the edge of the tub up by at least two inches. We are in our early 80&apos;s, and getting in and out of the shower/tub was dangerous. We managed. There was lots of storage, but they could have had one or two more shelves in the closet area. we went on a little open air train. The area is poor, but the narrator made the most of what he had to work with . I would not recommend this tour. There is a lot of shopping when you get off the ship. There were five big ships in port, so it was really crowded. They wanted your identification even if you paid cash for an item.